La Casa Felice has been lovingly restored to create a stunning property with a blend of contemporary and traditional features. Outside is dominated by an extensive covered terrace where you can eat or relax, overlooking the beautiful swimming pool and gardens. The house looks out on the Gran Sasso mountain range but is only about 40 minutes from the golden beaches of the Adriatic coast. Nearby, the town of Farindola has shops, restaurants and most amenities and the local village of Villa Cupoli has two restaurants and a bar. This is the perfect setting for a peaceful, relaxing holiday and an ideal base to explore one of Italy's lesser known jewels. I am a property developer/project manager from Brighton who discovered Abruzzo about 10 years ago after visiting friends in le Marche. It took me two years to find the right property and a further two years to complete the extensive renovation work. Whilst renting the house is my current priority, I hope eventually to spend more time in Abruzzo, so the house has been prepared with that in mind. I love the peace and tranquility of the countryside and never tire of the stunning views. To sit by my own pool and look at snow-covered mountains is a dream come true. I love to share my house with guests and to receive such amazing feedback makes it all worthwhile. I was looking for a character property in a secluded spot, with some land and beautiful views. Proximity to facilities such as shops, restaurants, bar etc was important, as was reasonable access to airports, motorways etc. I love the mountains so being so close to the National Park was a major selling point but also to be able to visit the beaches of the Adriatic. It took some time to find a house which ticked all the boxes, but I am happy that I have done so and most of my guests seem to agree! As I have got to know the area better, I have discovered new restaurants, places to visit etc and pass on my experience and tips in the extensive guide which is available at the house to all guests. The house is in a secluded position, the nearest neighbours are about 100m away, with stunning views of the Gran Sasso mountains and the valleys towards the coast. The village of Villa Cupoli, which has three restaurants, a bar and small store is a 1km walk and the beautiful mountain town of Farindola, with all facilities is a 5 minute car ride. The house is very comfortable, with a mix of traditional architecture and features and contemporary fittings and modern facilities. The thick walls keep it very cool in the Summer months and the covered terraces provide an escape from the midday sun. The pool is in the sun all day and is child-friendly with steps into a shallow end. We are on the edge of the Gran Sasso National Park, the park museum and offices are situated in Farindola. Bathroom 1 with large shower, wc, bidet and basin. Bathroom 2 with bath and shower over, wc and basin. The living room has comfortable sofa and chairs, TV and DVD, a range of films and extensive library. There is also a Bose ipod dock for your music. Fully fitted and equipped kitchen, with gas hob, electric oven, fridge/freezer, dishwasher, microwave, toaster and coffee maker. This large room also has a dining area seating up to 8 and access to the terrace and outside eating area. There are a number of ski resorts in the Abruzzo region, the nearest, at Campo Imperatore, has a furnicular which runs throughout the year. 2 golf courses, each around 60 minutes drive. Outside: The house is set in about 6 acres of land, with olive and fruit trees, a small vineyard and 360 degree views. The 10x5m pool is for the sole use of guests. To the front of the house is a large covered terrace with dining table and chairs and sofa and chairs for relaxing. There are other terraces around the house to take advantage of the views, a barbecue is provided and pool furniture and inflatables. Utility Room: Gas boiler and storage. Cleaning / Towels / Linen / Maid service: Bed linen and bath towels are supplied and changed weekly. Please bring your own beach towels. We enjoyed our week at Casa Felice. 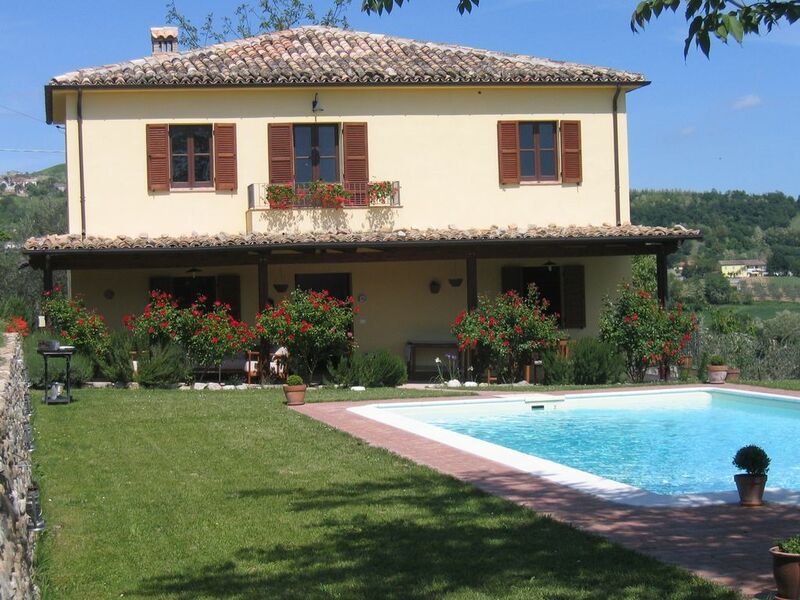 The villa is in a lovely location with great views of the surrounding country side and mountains. It is quite well equipped and having WiFi in such a rural location is a bonus. The garden is well maintained and the pool is a decent size - long enough to swim for exercise in and not just splash around in. Whilst at Casa Felice we didn't really go very far. We spent most days around or in the pool with trips out locally to get food or to eat out in the evening. Generally the weather was great but we had a couple of overcast days. We had a couple of spectacular thunderstorms during out stay but these cleared the air somewhat when it had become quite humid. One evening our son saw a wild boar rooting around in the garden (we think it was after mice!) but it ran off as soon as it became aware of him. We could often hear them though in the gully beyond the end of the garden. We ate out most nights and without exception the food was good and at times excellent - generally quite simple but freshly prepared from fresh ingredients and inexpensive. The pasta and arrosticini at the Osteria in Cupoli were both excellent - the arrosticini were probably the best that we had. The Locande del Brigande in Farindola has a more extensive menu including pasta, steaks, veal , lamb and pizzas. Stefanos Pizzeria in Conoprato was a particular favourite. Always busy with local families (probably best to book Friday/Saturday) the pizzas and arrosticini were very good and very inexpensive. La Tabotta in Penne was very good and a bit more upmarket but not much more expensive. The local restaurants (in Cupoli and Farindola) are closed on Wednesday evenings. We had spent a week on the coast at Pineta before going to Casa and whilst there we went to both Atri and Civitella del Tronto, both of which are lovely old towns with lots to see and recommended to visit (they are close enough to visit from Casa Felice). On our way back to Rome we went up to the Campo Imperatore, which is definitely worth a day trip or more. A really beautiful villa set in lovely grounds with amazing views in all directions. Inside the villa really is a home from home with a very well equipped kitchen - it seemed to have everything we needed including a full size cooker, fridge freezer and dishwasher. In the lounge there is a really good selection of books (novels and guide books) and a big selection of DVDs. There are 3 bedrooms which are all a good size. We did find we needed to shut the bedroom at first light because of the Golden Oriole which started singing loudly outside the window every morning! Outside there is the veranda which runs right across the front of the house - a lovely place for breakfast and dinner. We sat out every evening - even when it rained we were well sheltered. To the side of the house is a decked area with chairs and a table - this is really good for catching the morning and evening sun and doing a bit of lizard spotting! While we were staying we were lucky enough to have two evenings when we had really good firefly displays - it really is an amazing site with all the little lights flashing all around the garden - we even had a glow worm on the wall next to the pool. In the grounds there are fig and cherry trees and you can help yourself to the fruit if it is ripe while you are there. The pool is a good size - big enough that you can actually swim in it and there is a thermometer in there so you know what you're letting yourself in for before you get in. We are keen walkers and so visited Campo Imperatore several times. It is a bit of a drive up a winding and scenic mountain road (watch out for the deer) but it is really worth it when you get up there. It is an enormous plateau with some fabulous walks and on two of our walks we never saw another person - it felt like we had the whole place to ourselves. There is a book in the lounge of the villa which has details of some of the walks you can do in the area. Overall a beautiful villa in a great location and we will definitely be going back as we feel we have barely started to explore all the area has to offer. Thank you for your kind words. It's always rewarding to get feedback from our guests as we make every effort to prepare the house and gardens so that their stay is the best possible. Sorry about the weather - out of my control, I'm afraid! - but glad you enjoyed your stay - and if you do build that house, let me know, I'll be happy to help! The house was beautifully presented and comfortable. we were met by Mauro, the house manager, who made us very welcome. The setting is idyllic, beautiful views of the mountains and valleys and really peaceful. It was a treat to have a private pool, which was huge and we couldn't get the kids out. There are lovely spots to sunbathe or to have a rest from the sun. Our eldest ( 15 ) also appreciated the internet access and the selection of DVD's. We regularly take "villa" holidays and this was up there with the best. Many thanks. Thank you so much for your comments - so glad you enjoyed your stay - do come again! Casa Felice - a truly happy house! We had a wonderful week in this lovely house. The sitting room, bedroom and bed were all beautifully comfortable. We ate out in some really amazing local restaurants and also made full use of the spacious kitchen for relaxed meals inside or under the great covered outside area looking over the pretty garden and pool. We will certainly return to Casa Felice and would highly recommend it. If you want a peaceful getaway in a gorgeous location then this is definitely the holiday for you. Gorgeous views down to the sea and unspoilt countryside all around provide the perfect setting to completely unwind. A car is essential to visit the nearby town of Penne and the beach. The house is comfortable and modern with all the amenities you could need with the essential pool in which to cool off. We have visited twice now and will do so again. Highly recommended. The sandy beaches of the Adriatic are easily accessible, the resorts of Silvi and Pineto being about 40 minutes drive. The waterpark at Tortoreto is a favourite with children ( and some parents! ) and is about an hour away. Further afield there are less frequented beaches and rocky coves and the characteristic Trabocchi, traditional fishing piers. The nearest airport is Pescara, about 45 minutes distant and Rome is about 2 1/2 hours drive. Car hire is considered essential. The village of Villa Cupoli, with restaurants and a bar is a five minute walk and the town of Farindola, with bars, restaurants, shops and most amenities is 5 minutes drive. It is also home to the offices of the National Park and a small museum. Further away (15 minutes by car) the mediaeval market town of Penne has large supermarkets, banks and post office and all the amenities you would expect of a bustling town. Mountain bikes are available for hire locally, it is also possible to book horseback riding and treks in the region. A local chef will also cook for you at home on request. There is an extensive menu of local dishes - simply order your meal and wait for it to be delivered to you at the house. Booking Notes: Please contact owner for details. Changeover Day: Changeover day is Saturday. Notes on prices: Rentals in sterling for one week period, changeover day is Saturday.